You don’t have to be a health expert to be able to see and reap the benefits of fish oil. People of all ages all over the world are using fish oil to boost their memory, ward off serious health conditions such as Alzheimer’s disease and heart failure, and even effectively reduce the symptoms of ADHD and anxiety disorders. However, not all fish oil supplements are equally effective for every individual. The following review will help you determine if fish oil supplements are right for you and which type is the best fit. Fish oil supplements are generally taken to increase your intake of omega-3 fatty acids. Because your body does not produce omega-3 fatty acids on its own, you’re probably not getting what you need unless you’re eating fish for every meal. Be careful with the grade of fish oil you buy, however. If you are prescribed fish oil supplements by a physician or nutritionist, get the pharmaceutical-grade, as the majority of these capsules is fish oil. The oil is made as fish is processed until it has produced oil and water. The oil and water are separated, and antioxidants are added to the oil to be stored in capsules, which can then be purchased over the counter or through a pharmacy. Although it may sound like a long process, the end result is simple: easily swallowed capsules with numerous benefits to your body, especially to your brain. Although we may not be health experts, we have performed extensive research trying to find the best fish oil supplements. While we are not physicians or pharmacists ourselves, we take our information from only the most qualified and reputable sources, such as the Mayo Clinic, Johns Hopkins University, and professional pharmaceutical organizations. Overall, the best health-food-grade fish oil supplement of those we reviewed was Bronson’s Brand Omega 3 Fish Oil. Health food grade means it was manufactured in a facility safe to be used for food production and storage. Health-food-grade-quality products are safer for consumption and are generally free of contaminants that would cause or aggravate health conditions. When looking for any kind of supplement, be sure that the product is domestically produced in an FDA- and cGMP-registered facility. This indicates that the supplements you’re taking are determined safe and effective by the FDA. Bronson is so confident you’ll love its product that the company backs it up with a guarantee for a full year. That’s right. With a 100-percent-customer-satisfaction, money-back guarantee, even if you have used half the bottle, you can return the product to the manufacturer for a full refund. 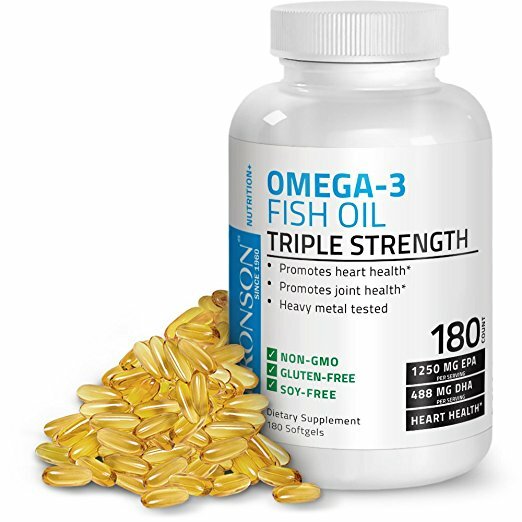 They are the best fish oil supplements in terms of potency of those we researched, with 2720 mg per serving for optimum heart and joint health. Not only that, but they are safe for people of all ages, even children. If you have people in your family who are gluten-sensitive or intolerant, rest assured that Bronson’s fish oil is manufactured in a non-GMO and gluten-free facility for a product that ensures your safety and well-being. The reviews on Amazon for Bronson’s fish oil supplements are 85 percent resoundingly positive, with many people mentioning that there is virtually no aftertaste. You won’t be burping fish breath into your family’s faces after taking these, which your family will appreciate. Don’t just take our word for it though. If you’re still on the fence, Nobel Prize winner and world-renowned nutritional scientists like Dr. Linus Pauling recommend Bronson’s fish oil supplements. 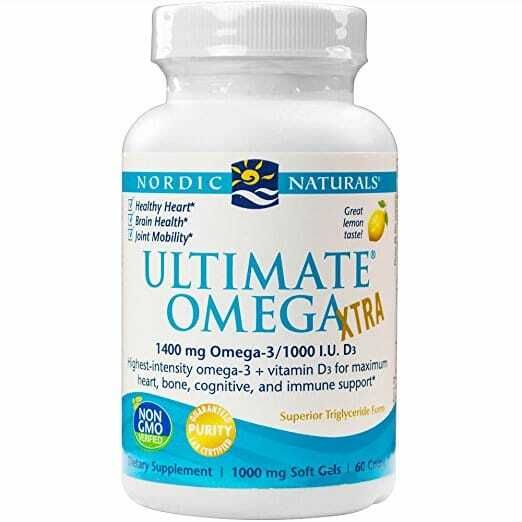 Coming in as the blue-ribbon winner for best pharmaceutical-grade fish oil of the supplements we’ve reviewed is Ultimate Omega Xtra by Nordic Naturals. A supplement that is labeled as pharmaceutical grade is one that is most pure and has undergone rigorous FDA scrutiny to become cGMP certified. 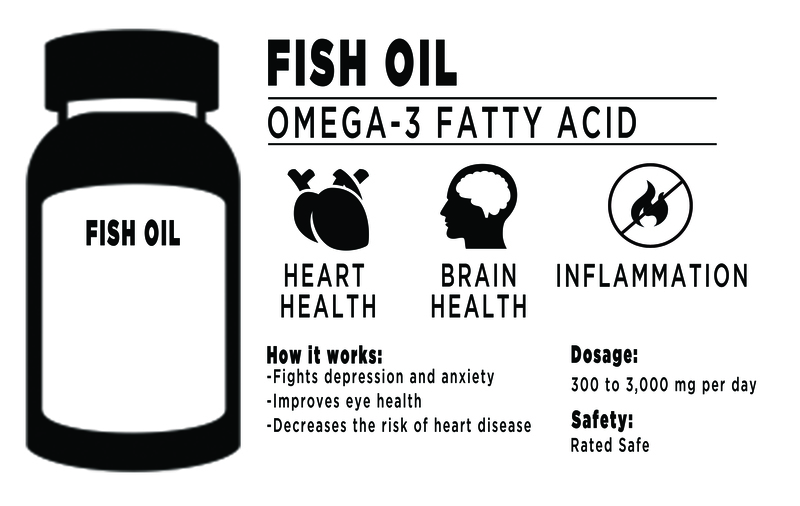 The Nordic Naturals product is the purest of those on our list, having a higher concentration of fish oil per serving. In addition, its headquarters has earned certification from NSF International, which is the highest certification available for supplements of any type. Curious about Nordic Naturals fish oil and what it can do for you? The NSF International website contains information on all supplements that it has certified, including all of Nordic Naturals’ fish oil products and other supplements. Although the Omega Xtra was reviewed here, Nordic Naturals does carry other products depending on the level of purity, flavor, and freshness you’re looking for. This particular product tops our list as the purest product on the market today. Since 1995, Nordic Naturals has been committed to providing people with safe and effective fish oils, as evidenced by its new headquarters that is on point to achieve LEED gold certification. This certification recognizes projects for outstanding performance in areas involving human and environmental health. If you’re looking for a brand that has integrity and a good reputation for putting human safety above all else, Nordic Naturals is the clear winner. There are plenty of good reasons why Nordic Naturals is regularly chosen and recommended by both research institutions and universities as well as physicians and nutritionists treating people for cardiovascular and neurological conditions. To date, there have been more than a dozen published scientific studies regarding this product, with over 30 in process. The reigning champion in terms of fish oil for this review is the Nature’s Bounty supplement. Nature’s Bounty fish oil is the most affordable of those we reviewed and is easily found online or in many locations near you. Nature’s Bounty ensures an ecologically friendly product from Peru, a country known for its strict standards and governance pertaining to imports and exports. Despite being sourced internationally, it is certified in the United States and the costs for the product are still cost effective. Another great feature of Nature’s Bounty fish oil, aside from the fact it’s an ecologically friendly product, is that it is coated to minimize the fishy aftertaste and burps commonly associated with fish oil supplements. It is rated the reigning champion in this review due in part to its affordability and also because, per serving, it contains all the recommended daily allowance of omega-3s. Affordability, accessibility, and an environmentally friendly source are what put Nature’s Bounty as the #1 product on the market today. To increase accessibility, it also comes in smaller soft gels that are even easier to swallow. Nature’s Bounty is a product that you can pick up in your local grocery store or online. It is affordable, and it’s odorless so you’ll hardly realize you’re taking a supplement at all. 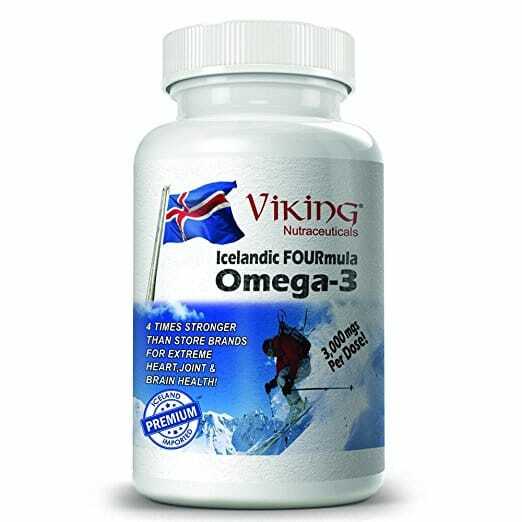 Viking Nutraceuticals Icelandic Formula Quadruple Strength is another brand of omega-3 fish oil supplements worth considering. It is not a domestic product, so the higher price is likely due in part to the fact that the supplements will be shipped internationally. If you’re looking for a product that you can pick up at the corner store, this is not for you. Despite being an international product, it is certified pure and 100 percent toxin-free. So, if you’re looking for a supplement that you know will be safe to consume and that won’t have any trace amount of toxins, Viking Nutraceuticals is available online. The only reason that it did not get a higher rating in our review is because it’s not certified by the NSF, which is the federal program in the U.S. that analyzes and certifies supplements. However, it is manufactured with 100 percent sustainable technology and is dolphin-safe. Viva Naturals fish oil is one product that you don’t want to overlook. It has a sufficient amount of fish oil per serving and a number of positive reviews online, and it is very affordable. 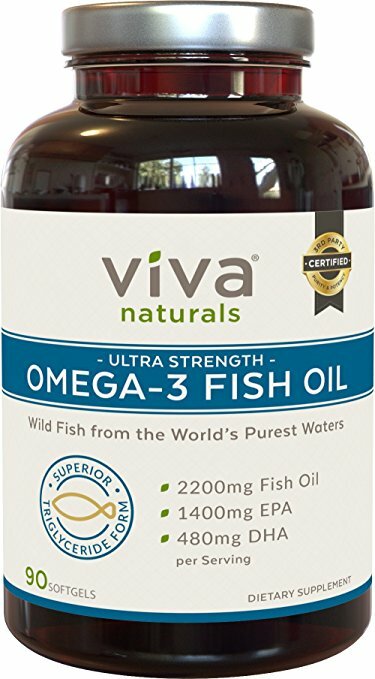 With 90 percent four- and five-star ratings on Amazon of over 1,100 reviews to date, you really can’t go wrong with Viva Naturals Fish Oil. Its high concentration of omega-3s per serving means you only have to take two soft gels every day for your full recommended daily servings. Omega-3s work well to counteract the effects of various mood and mental disorders such as depression and anxiety. One of the most common mental disorders in the world, depression has symptoms that include general sadness and/or loss of interest in life as well as lethargy. Anxiety symptoms include constant worry and nervousness. However, studies show that people who consume omega-3 supplements regularly report fewer depressive episodes. Additionally, people with depression or general anxiety disorder who started taking omega-3 supplements reported an improvement in their symptoms. As you know by now, there are three types of omega-3 fatty acids: ALA, EPA, and DHA. The research done on this subject has shown that EPA is the most effective at battling the effects of depression, so if you’re taking omega-3 to help with depression, find a brand that is high in EPA fatty acids. One study found EPA to be as effective as Prozac in terms of fighting depression. It certainly would have fewer side effects and might be worth a try. Many people taking omega-3 fish oil supplements are doing so in order to improve eye health. DHA in particular is a crucial component of both the brain and your retinas. Many vision problems are caused by a DHA deficiency in the body. If you are having problems with your vision, discuss with your eye doctor whether fish oil supplements would help. Omega-3 fatty acids have also been linked to reduced risk for macular degeneration. Although macular degeneration has long been thought of as a condition experienced only by the aging population, people are beginning to contract it at remarkably young ages. Macular degeneration is one of the most common causes of permanent eye damage and blindness. One good reason that OB-GYNs and midwives are prescribing fish oil supplements to their pregnant patients is that the oil promotes healthy brain growth and development in utero and also in infants. As mentioned above, DHA accounts for 60 percent of the polyunsaturated fatty acids in the retina of the eye. It also accounts for 40 percent of these crucial fatty acids in the brain. When taken during pregnancy, you can improve the brain functioning and vision of your unborn child. For this reason, many formula-fed infants are fed DHA-enriched formula. The two leading causes of death worldwide are heart attacks and strokes. Omega-3 greatly reduces your risk factors for both conditions. Before modern research was conducted, some studies done years ago showed that communities around the world that ate a diet rich in fish experienced less strokes and heart attacks. It has since been discovered that a diet rich in omega-3 fatty acids will dramatically decrease your risk. If you have a family history of heart disease or strokes, we recommend finding a fish oil supplement. Your body doesn’t produce these essential nutrients naturally, and so it is up to you to ensure that you get it through diet or supplements. If you have or know a child who has been diagnosed with Attention Deficit Hyperactivity Disorder (ADHD), then you are probably already pretty familiar with this behavioral condition that typically involves lack of impulsive control, inattention, and hyperactive behavior. Studies have historically shown that children diagnosed with ADHD also present with lower blood levels of omega-3 fatty acids. Other serious symptoms of ADHD include aggression and restlessness. However, on omega-3 fish oil supplements, kids who have been diagnosed with this disorder have exhibited fewer reckless and aggressive behaviors. Omega-3 supplements are not harmful if you take them without needing to. So, if you have a child who is exhibiting some of these symptoms, perhaps a fish oil supplement would help. As with any supplement, it is important to consider the potential side effects of the drug as well as the benefits. Omega-3 fish oil supplements have an awesome reputation in the world of diet and nutrition. However, the side effects of taking fish oil supplements exist, although they are extremely rare. In order to help you make the most informed decision, we have provided five of the most common side effects that you may experience if you’re taking too many fish oil supplements. If you take large amounts of fish oil, then you will likely have an increased risk of hemorrhagic stroke or nosebleeds. The reason for this is that fish oil does a great job of breaking down blood clots and helps to prevent blood platelets from clumping together. Although usually considered a good thing, your blood does need to be able to clot to prevent health conditions such as blood in your urine or profuse bleeding. It is important to note that few people are actually at risk of this happening, since the only populations that have exhibited these side effects are populations of people whose diets are rich in fish, such as Native American populations in Alaska. Although rare, some people do experience mild skin rashes or itching once they start taking fish oil supplements. These could be signs of an allergic reaction, or they could just be your body's natural reaction to an unfamiliar product. Either way, make sure to address the problem with your doctor as soon as you can to rule out any possible allergy. Note that some people who have sensitivities to animal protein may have issues taking fish oil supplements, which frequently utilize bovine gelatin for the capsules. If you have protein sensitivity or are vegan or vegetarian, pay close attention to what the fish oil supplements you choose to take contain, and obviously, do your research before purchasing one. Doctors and researchers still have not been able to figure out why exactly some people experience back pain after starting omega-3 supplements, but it does happen in rare cases. Make sure that you talk to your doctor about what is safe and necessary for your diet before you continue to suffer with back pain unnecessarily. One important thing to remember with fish oil supplements is that they obviously contain fish oil and, as a result, will likely taste, well...fishy. Still, many people are surprised when they experience a fishy aftertaste after taking the supplements. This is extremely common across many different brands and dosages of omega-3 supplements. The odor may get stronger over time, so if you open your bottle of supplements one day and there is a particularly strong fish smell emanating from it, note that your supplements may have gone bad. Be sure to never take supplements past their expiration date and always as directed on the packaging. If the fishy aftertaste is the only side effect that you're experiencing, consider taking your supplements with meals. You might also think about taking them right before you go to bed to give that fish aftertaste time to wear off before the morning. If you experience nausea and/or vomiting after taking your supplements, there are a couple of reasons for this and things you can try. For starters, try taking your oil with food. Otherwise, your supplements may be reacting to being in an empty stomach. If you are experiencing vomiting and diarrhea, check that the expiration date hasn't passed on your omega-3 oils. If it's well within the expiration date, consult your doctor. 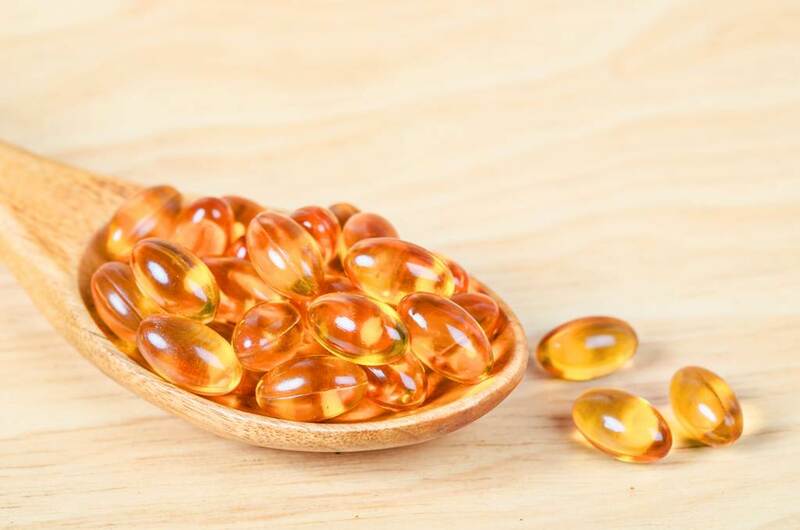 When you're looking at a bottle of fish oil supplements, make sure that you understand that the milligrams on the front of the bottle do not necessarily indicate the number of milligrams of omega-3 that will be in each capsule. Typically, 300 mg is going to be sufficient to cover an omega-3 deficiency. You will need three to six of these pills to get the benefits, as physicians generally recommend between 1000 to 1200 mg of omega-3 per day. In other words, pay close attention to the omega-3 content rather than the regular serving size. The minimum recommended dosage of omega-3 is 500 mg per day without any health conditions. If you are primarily concerned with the amount you need for optimum health, the minimum is 1000 milligrams of omega-3 every day. If you have been diagnosed with an omega-3 deficiency, you should take 2000 mg or more per day. Please consult with your physician if you have concerns about exactly how much you need to take. Generally speaking, you should never be taking more than 3,000 mg a day. With fish oil supplements, a little bit will go a long way. There are other factors that will determine whether these dosages are too much or too little for your needs. For example, if you already eat a diet high in omega-3 fatty acids, such as through certain types of fish like salmon or tuna, you may already be getting the recommended amount. If you eat at least two servings of fatty fish per week, that will take care of about 1000 mg of omega-3. The American Psychiatric Association recommends that all adults eat fish at least twice a week to ensure they are getting enough of these essential nutrients. Depending on how frequently you are eating fish, your doctor may have a different recommendation for you. Now the tricky part comes in. It can be difficult to know on your own how many fish oil supplements you should take every day. After discussing it with your physician or dietician, determine how much EPA and DHA you need. Any supplements that you buy online or over the counter will have the EPA and DHA information within the nutrition facts on the back of the box or bottle. Again, when you are looking at labels, be sure that you are looking carefully at the amount of omega-3s. A soft gel that has a 1000 mg serving size might only have 300 mg of Omega 3s. Disclaimer: Our content does not constitute a medical consultation. See a certified medical professional for diagnosis and recommendations.